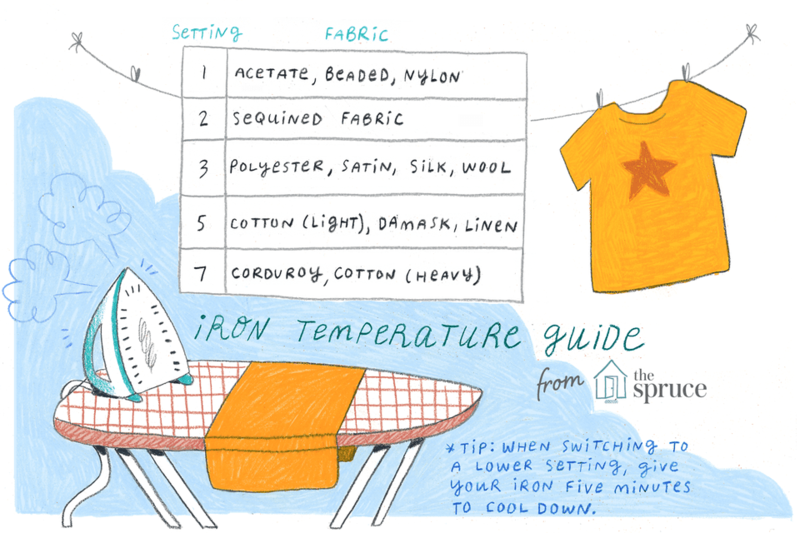 Perhaps the most critical thing you should learn before ironing clothes or linens is the correct temperature setting for the type of fabric. Selecting the correct setting on an iron can make the difference between a good job and a disaster. The right temperature selection makes ironing easier, quicker and gives a more professional result. The wrong temperature can mean that you have to do more work to remove wrinkles or, even worse, burn a hole in the garment that can not be repaired. Acetate 1 Press on the wrong side of the fabric while it is still damp. Beaded 1 Place the fabric on a plush white towel, press on the wrong side using a pressing cloth to prevent damaging the beads. Cashmere 3 Do not press, instead, use steam only. For hard, set-in wrinkles, press on the wrong side using a pressing cloth. Corduroy 7 Place the fabric on a plush white towel, press on the wrong side of the fabric. Turn the fabric over and use steam-only on the front side of the fabric to refresh any crushed pile. Cotton, lightweight 5 Press dark colors on the wrong side of the fabric to prevent shine marks. Cotton, heavyweight 7 Press the fabric while still slightly damp. For dark colors, press only the wrong side to prevent shine marks. Damask 5 Use a pressing cloth between the fabric and the iron to prevent snagging long fibers. Lace 3 Use a pressing cloth between the fabric and the iron to prevent snags and pulls. Linen 5 Iron on the wrong side of the dampened fabric for the best linen finish. Nylon 1 Always use a pressing cloth for extra protection between the fabric and the iron because nylon burns easily. Ramie 3 Iron on the wrong side of the fabric while it is still damp. Rayon 3 Iron on the wrong side of the fabric to prevent leaving a shine on rayon fabric. Satin 3 Press on the wrong side of the fabric with a pressing cloth between the iron and the fabric. Use no steam which can leave watermarks on the fabric. Sequined fabric 2 Do not iron because sequins can melt. Use light steam on the wrong side of the fabric to remove wrinkles. Silk 3 Press on the wrong side of the fabric. Do not use steam which can leave watermarks on some silk fabrics. Velvet 3 It is preferable to never iron, only steam, velvet to remove wrinkles. If the wrinkles are severe, place on a plush white towel, press on the wrong side of the fabric with a very light touch. After ironing, use steam only on the front side of the fabric to refresh crushed pile. Woven Wool 3 Use a damp pressing cloth between the iron and fabric. Iron on the wrong side of the fabric to prevent snags and shiny marks. Unless you are just ironing a single garment, separate your wrinkled clothing and linens by type of fabric before you begin ironing. Start by ironing the items that require the lowest temperature like acetate and nylon. Then move to silks, polyester, and other synthetic fabrics. Finally, iron cotton and linen fabrics. If you must switch back to a lower iron temperature, give your iron at least five minutes to cool down before you use it again. You'll be glad you did! When in doubt about what temperature to use, start low and iron on the wrong side of the fabric with a pressing cloth. You can always move the temperature up gradually to remove tougher wrinkles and still prevent scorching. Scorch marks can be difficult to remove but not always impossible if caught early and treated while they are light in color.